The Tourney of Stahleck is the world's biggest A Game of Thrones LCG tournament. Players from all over Europe and beyond meet at Castle Stahleck at the heart of Germany to compete over three days in different tournament formats and celebrate the Only Game That Matters. Stahleck 2019 will be held on 21-24 of November 2019. 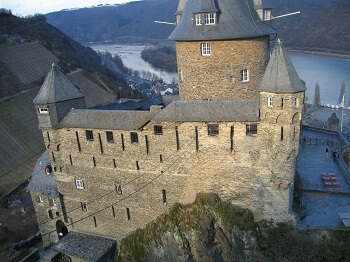 Castle Stahleck in Bacharach am Rhein, some 50 km south of Koblenz and 50 km west of Mainz. Some events, mainly the preliminary rounds of the Joust and Melee tournaments, will take place in the town hall, next to the train station. If you don't stay at the castle, you can look for accomodation on websites like www.booking.com, www.hrs.com or www.laterooms.com. Driving on the German Highway A61, you take the exit named "Rheinboellen". From there you go on in direction to Bacharach. You reach Castle Stahleck via Bacharach-Steeg. There are many parking slots next to the castle. Bacharach lies on the railway track Mainz - Koblenz. Walking from the station in Bacharach to the castle takes about 20 minutes. Details on connections you can find on the website of the German Railway Service. There are several big airports close by: Köln/Bonn (CGN), Düsseldorf (DUS), Frankfurt (FRA) and Frankfurt/Hahn (HHN). The train connection to Bacharach from any of these should be decent. Köln/Bonn: about 3 hours starting at €29. Düsseldorf: about 3 and a half hours starting at €36. Frankfurt: about 1 hour starting at €18. Frankfurt/Hahn is closest (about 35 km) but without direct train connection. If you are a bunch of players its best to take a taxi (for about €70). Otherwise be prepared for a quite long trip with bus&train. The Road to Stahleck European Circuit is a series of large international community-organized tournaments that leads up to the Tourney of Stahleck in November. Tourney of Stahleck Bacharach 21-24 November You already found it!